Guzaarish directed by Sanjay Leela Bhansali and starring Hrithik Roshan and Aishwarya Rai in the lead is all set to release this Friday. We bring to you the first review of the movie published online by Taran Adarsh. 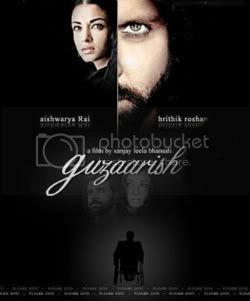 Guzaarish has been given 4 stars out of 5. But before making a judgment we should wait and see what other reputed reviewers have to say about the movie. Sanjay Leela Bhansali's Guzaarish Movie Review Hrithik and Aishwarya are seen in a lackluster facade and that's what makes the characters so plausible. While Hrithik is seen sporting a beard and has even put on weight, Aishwarya is seen in sober outfits. In fact, the two actors have gone through a drastic appearance change and both pressurize you to believe that they are indeed Ethan and Sofia. It must be said that Hrithik and Aishwarya exude a certain dignity and elegance, much needed for a sensitive film of this magnitude and caliber.It must have been an arduous task for Hrithik to carry off the Paraplegic character of Ethan Mascarenhas, but he depicts the part with flourish. It's a great risk in filmy norms to have the hero of the film almost entirely on a wheel chair, but Hrithik has never hesitated or been irresolute in putting himself to adverse conditions, in order to achieve excellence, in whatever character he chooses to depict. Kudos to Hrithik for accepting a role that's truly opposite to his larger-than-life image and portraying it with elan. After delivering a commercial success in the form of Bheja Fry last year, director Rajat Kapoor comes up with another witty film, Mithya. Starring Ranvir Shorey, Brijendra Kala, Neha Dhupia, Naseeruddin Shah in the lead, Mithya hits the screens this week. Sometimes just talking about a film spoils the fun of watching it. It's true what they say about some films — the less you know about it before you go watch it, the better. Rajat Kapoor's Mithya is exactly that kind of film, so you can understand my dilemma even as I attempt to review the film here. Much like Superstar, the other film at the cinemas this week, Mithya too revolves around the life of a struggling Bollywood actor. Ranvir Shorey plays VK, the struggler in question, whose life turns upside down when he gets inadvertently involved with the underworld owing to the striking resemblance he bears to a person they have not-so-noble interests in. Alas, that's as little as one can reveal about the film's plot without giving out spoilers galore. Mithya is one of those rare films that constantly surprises you, it's one of those films that never stops unravelling, a film that never reveals all its cards at once. If that's what you're looking for on an evening out at the movies — unpredictability, surprise, the unfamiliar -- then Mithya is your best bet. In fact, it's got more surprises than both Johnny Gaddar and Manorama Six Feet Under. Starting off as a comedy, Mithya straddles several genres as it makes it way from start to finish — thriller, romance, suspense — but eventually it settles comfortably into its identity as a black comedy. 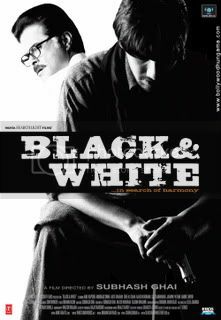 Subash Ghai is back holding the reigns of his next film, Black and White. Set out to be a socio political trailer with throws light on terrorism in India, Black and White will be a departure from the normal Subash Ghai, larger than life movies. Black and White which has been in the making for quite a while now has Anil Kapoor in the lead. Main Chala is the latest track from the movie which has hit the various TV channels and here is an exclusive glimpse of it. The music of the film is given by Sukhwinder Singh. Shahid Kapur and Kareena Kapoor’s off screen romance may have ended, but hitting screens this Friday is their romantic comedy, Jab We Met. The story of Jab We Met is an assorted mix of all that we have seen in those typical mushy romantic Bollywood films. Aditya ( Shahid Kapur ) a very serious depressed business man whose girl friend has just left him meets Geet ( Kareena Kapoor) on a train journey. Geet is just the opposite of Aditya, bubbly and full of life. Accidentally both Geet and Aditya miss their train and now Aditya has to reach Geet safely to her parents place in Bhatinda. Geet’s fun and frolic attitude soon brushes up on Aditya and he starts developing feelings for her. But Geet is already in love with someone else. The rest of the plot could be predicted by my five year old nephew. Jab We Met is your typical Bollywood romantic film : 5-6 songs poured in , designer clothes, one big Punjabi family, boy – girl have fights then live happily ever after. On the story front, Jab We Met is as predictable as it gets. Now it’s up to the actors to lift this film up. Shahid Kapur gets into the skin of his character perfectly and does a commendable job. But it’s Kareena Kapoor who steals the show with her non stop jabbering vivacious performance . The fact that Kareena looks simply fabulous in the film, is simply icing on the cake. Though both Kareena and Shahid give good individualistic performances, the chemistry is seriously missing. There is no romance in the air and that’s a big minus point for Jab We Met. Now the actor to watch out for is Tarun Arora, who gives the hammiest performance ever by any actor on the big screen. His acting is so awkward that you feel embarrassed watching him on screen. But the irony is that his hamming is what will have you in splits. Doubt if the hamming was intentional. Vishal Bharadwaj as producer and the man who gave this year’s most beautiful film : Black Friday, Anurag Kashyap as the director. With such incredible people behind the film, expectations are sky high from No Smoking. Does it live up to the expectations? Read on to know. No Smoking is the story of John Abraham whose parents weirdly have named him as K and he has an asthmatic brother named J. Weird is it? No this alphabetical naming of children seems normal when compared to the story. John is a chain smoker and this creates problems between him and his wife, Ayesha Takia. Determined to save his marriage John, on the persistence of his friend (Ranvir Shourie) decides to go to a rehabilitation center, Prayog Shala that is run by Paresh Rawal (who used to be Hitler’s friend, no pun here). Now this is no normal rehabilitation center. They do not give you medicines or any form of treatment to help you quit the stub. They simply tell you that if you do not quit smoking, they will chop your fingers, kill your family and destroy your life. And they charge a Rs. 21,11,111 fee for their services. Now that’s clearly a one of its kind rehabilitation center. How John Abraham tries his best to save himself from the people running Prayog Shala makes for the rest of the film. Now the funda is simple, to enjoy a movie you need to first understand it. But the problem with No Smoking, is that however much you try to extend your creative and imaginative boundaries, No Smoking leaves you confused. Getting into Harvard could be easier than understanding the plot of No Smoking. Vikram Bhatt’s Speed is a thriller with Sanjay Suri playing an under cover MI-5 agent. His wife ( Urmila Matondkar) is kidnapped by Aftab Shivdasani and Sanjay is told to follow certain instructions if he wants to see his wife alive. The kidnapped Urmila manages to get in telephonic contact with Zayed Khan. Now Zayed, is the only one who can help her out. If you thought Vikram Bhatt couldn’t make a movie worse than Red. Then yes, probably you are right. But Speed comes very close to beating Red, to Vikram’s worst film ever. Now if there is one thing lacking in Speed, then it’s speed itself. The movie moves at a sluggish pace with a story so predictable that you may actually have fun guessing what the next scene would be. And mostly your guess would be right. The movie seemed to have shot in London, could have easily been shot in Jhumri Talai without making any difference. The cinematography is that bad. Apart from a few Angrez people, no part of London has been captured on camera. The action director seems to have got a Krrish hangover. Actors do not fight, they fly and perform gravity defying stunts, which seem so very fake. The makeup artiste seriously needs to consider a shift of career. Consider, Sophie Choudhary a supposed terrorist who has loads of makeup enough to make a super model, jealous. Gosh! After an impressive debut in Ek Hasina Thi, director Sriram Raghavan is back with his next outing, Johnny Gaddaar. Without building up any suspense, let me proclaim, that Johnny Gaddaar is one of the finest Bollywood thrillers to hit the big screen. My days of kvetching that Bollywood film makers cannot make good thrillers are over. Sriram Raghavan has arrived!!! The story revolves around a gang of five men - Vinay Pathak, Neil Nitin Mukesh, Dharmendra, Zakir Hussain and Daya, who gather Rs. 2.5 crore to give to a corrupt inspector in return of some valuables worth a fortune. Seeing the huge sum of money, one member of the gang decides to betray his Gang and decides to keep the entire sum of money for himself. Then begins a game of deceit, murder and revenge. Johnny Gaddaar boasts of an impeccable script ( that is half the battle won) , paramount amount of twists and turns, and most importantly it does what an ideal thriller should do: It involves the audience in the film. The movie tells you the Gaddaar at the very outset and it is up to you to see the clues given and stress upon your grey cells and enjoy this taut thriller. Just when you realize, ok this is the path the movie is going to take, you are exposed to a new lane. A lane more racier than the one you were treading before. The remarkable twists and turns of Johnny Gaddaar and particularly the ending of the film will have you smile on the cruel works of destiny. Director Sriram Raghavan is a remarkable story-teller. He pays homage to his idols, James Hadley Chase, Vijay Anand and Amitabh Bachchan and weaves them very innovatively into the plot of the film. Infact the Gaddaar of the gang borrows his plan from Amitabh Bachchan’s film, Parwana. Infact, Johnny Gaddaar should serve as a textbook on how Bollywood thrillers should be made. The movie deals with a singing competition held in America to search for a Desi Idol. The price is a huge $25,000 and it attracts Indian’s from allover America. The movie revolves around the different contestants who participate in the competition, which takes place for 2 days. The movie may not have been publicized heavily. The promos may look tacky. The color may look dull. 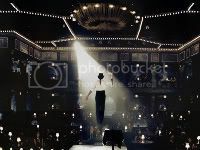 But take my word, once in the theatre you shall forget all that and have a great time. Director Manish Acharya weaves his characters wonderfully and presents them in a so real to life way that you can not help but relate to them. Take the typical khakra munching Gujju family, “The Patels”, who accompany their daughter, Preeti, to the competition. Or the wannabe Bollywood “don’t know Hindi” starlet. Then you have the statistical genius Amitabh Bachchan fan. The scheming socialite played wonderfully by Shabana Azmi. You also have the angry Bhangra singer who uses expletives in place of punctuation marks. There is the English man who wants to win the competition, although he knows only two songs. And there is my personal favorite, the slimy lecherous event organizer, Mr. Bokade. Expect Shabana Azmi, the movie does not have any stars but yet they all shine. Manish Acharya extracts wonderful performances from all his actors. The movie may have hordes of supporting actors, who just chip in with a line or two. But each one of them does a great job and remains with you long after the movie has ended. The movie also has a wonderful ending that touches you and leaves a subtle message. Four good for nothing men (Sharman Joshi , Rajpal Yadav, Kunal Khemu and Tusshar Kapoor) realize that the only way to get rich is to marry an “Amir Ghar Ki Ladki”. When the rich Om Puri along with his grand-daughter ( Tanushree Dutta) land at a neighbouring bungalow, the four men try their best to make Tanushree fall in love with them. And also try to make the audience laugh. Armed with a script that is as old as the Harappan Civilization and with actors who are competing for the Worst Actor Award, director Priya Darshan sets off to make the audience laugh. And as expected he fails miserably. Clichéd scenes, garish cinematography, tiring songs and perhaps the most banal screenplay are what you take back after watching Dhol. You have Rajpal’s overacting ( some may find it funny) and Tushaar’s no acting. Kunal Khemu along with a wardrobe and look malfunction also suffers from an acting malfunction. Tanushree Dutta and Payal Rohatgi are busy trying to out do one another for the “ Worst Actress Award” . Sharman Joshi is the only one who manages to rise slightly from the sinking ship. If you get an impulse to leave the theatre after the first half, then don’t even bother to think twice before doing so. Because if the first half can give you a minor headache, then the second half has material good enough for a migraine. You have a boring flashback, a rather extended typical Priya Darshan climax, a silly ending and a severe headache as the film terminates. Bollywood critic Taran Adarsh reviews the Anant Mahadevan thriller, Aggar. Aggar Star Cast Tusshar Kapoor, Shreyas Talpade, Sophie Choudhary and Udita Goswami. Aggar Movie Story Becoming attracted to the wrong man can have deadly consequences. Janvi's [Udita Goswami] life seems ideal on the surface: she runs a thriving business and is married to Dr. Aditya Merchant [Shreyas Talpade], a psychiatrist. But a faint air of discontent begins to creep into her relationship when she begins suspecting her husband of having an extra-marital affair with Radha [Saadhika], an interior designer. Janvi impulsively gets drawn into a steamy affair with Aryan [Tusshar Kapoor], who works in her company. 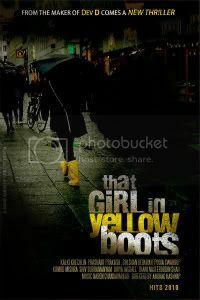 But in a strange twist of events, she realizes that she has stumbled badly and tries to break off her affair. Aryan, however, is not willing to give her up so easily and his attraction to her soon becomes a dangerous obsession. Aggar Movie Review AGGAR has three interesting words below its logo -- Passion, Betrayal and Terror -- and AGGAR does justice to it in those 2 hours. There's never a moment that gives you the feeling of déjà vu. Not once do you feel that it's one of those been-there-seen-that kind of movie-going experiences. Note the sequences: Sophie Chaudhary accidentally falling of from the rooftop mansion… The gradual attraction between Tusshar and Udita… Udita's outburst in the office. Ananth executes the written material wonderfully well. But, as mentioned earlier, the culmination to the tale should've been equally unpredictable, not abstract mind you. A badly bruised Tusshar emerging from the pool and beating Shreyas black and blue is a complete cinematic liberty. Ditto for the end.